Thanks very much Ealing - but TBH, I have gained a lot of experience in the past, working largely in a smaller scale with several group projects. Plus, dare I mention my own personal projects, which very embarrassingly never got anywhere near finished. I usually start to have doubts and abandon things, thinking I have found a far better idea, around this stage in every personal project before this one. The achievement for me is that after 12 months I still have the appetite to carry on without repetition, hesitation or deviation (well, not a lot, anyway). After all, P4 is just OO gauge with an extra 2 point something millimetres of track gauge and slightly smaller flanges. Why do people think it is so difficult? I should almost certainly have started with something simpler, but my brain doesn’t really do simple, unfortunately – not as far as layouts are concerned, anyway! To me this one is just about as simple as I could ever contemplate. I think deep down I have always had an appetite for a light railway/tramway kind of layout. I remember seeing layouts like Tregarrick when it first burst onto the scene - and realizing then just how much fun it could be. P4 seems to be the only route I have tried that makes it seem achievable. Anyway, too much time has been spent in the last few days contemplating my navel – I really ought to get on with "Year Two" of the project! Armchair I think you have done really well so far. The layout is bigger than I have ever tried in p4 and you have got a lot further than I have. Yes I build loco's and rolling stock quite successfully, though the last 5% I find difficult to finish, and don't start me on couplings! Keep chipping away at the project it will in the end come off no matter how you feel! I still think of the layout as small - at least for phase 1, which is just 2 scenic boards and a sector plate. The scenic part is only just over 5 feet long. With scenic boards 3 and 4, it will be about double that length. The third scenic board is already in existence and shown in a few photos. It won't get any more work done on it for a long time though. Possibly, the layout looks big and complicated because of the fiddle yard sidings at the back. The track for this was in fact very quick and easy to build - trackwork built without chairs makes a huge difference! The wiring is coming along well now, so I should finish it by the end of this week, or early next week. It is DCC after all, so what could be simpler? Then, I can play with my 2 locos for a while. That is always a great morale booster! I am really itching to get started on a loco building programme, so have an extra incentive to get the wiring finished soon. I'm still working on the wiring, but needed a break, so here's some more navel contemplation to be going on with ..... plus the start of a loco thread coming up shortly in another corner of the "Armchair Modeller" digital empire. Elsewhere, a nasty virus on one of my PCs set me back a few days, plus the nice weather last week, so it will be a day or two before I finish the wiring. All is going well so far though. Onto locomotives, I will attempt to get one or two more up and running over the next few months. The Model Rail Sentinel shunter was a very easy conversion, as was the Bachmann Class 20 chassis. The Class 20 will be described in the first new thread. These were required mainly for track testing, though the Sentinel is an obvious choice for an (almost) RTR loco for a steam tramway. I will detail and repaint this in due course. The Class 20 is a bit more of a headache long term though - a bit large for my fictitious line but fairly bomb-proof, so very useful for track testing and checking that clearances are adequate for larger stock. Beyond these locos, the options for converting RTR locos are rather limited. The Bachmann Drewry shunter and the J94 0-6-0T are just about all I can think of for the moment. For a fictitious line, the safe bet is to go for kits of locos that might have been bought new for the tramway, or locos known to have been sold secondhand. It is probably a lot more work than the more usual main line model railway, but to me it seems much more interesting - for the moment, at least. I was wondering how many locomotives it is feasible for an undisciplined modeller like me to build in a year? 2 blokes in a backstreet workshop in Manchester managed 131 in 1882 – Beyer and Peacock I think they were called. I bet they had a bit of help though! Nonneminstre Planet shunter - chassis already part-built last year. ...plus a few other longer-term projects for which I am gradually buying components, including the J72 chassis I have been discussing for conversion to an EB Wilson loco, complete with a "dustbin" dome. The wiring is finished now, despite a couple of shorts that proved awkward to find. One thing about good old DC is that at least you can easily isolate sections to find the fault. With DCC, the only way seems to be to gradually disconnect the wiring, connection by connection until you find roughly where the short is. One turned out to be the lack of an insulation gap on a couple of sleepers near a turnout. The other was a misunderstanding about where the power to a crossing ended. The layout is likely to be worked under "one operator in steam" principles, so I haven't bothered splitting it into separate power districts. Here is a photo of the underside of the tidier of the two boards. The wiring has not yet been properly secured to the underside of the baseboard - this will only be done once some thorough testing has been done. The DCC bus runs either side of the diagonal support. I used bare copper wire soldered to screws. On boards as small as this, I doubt if any exacting rules have to be applied regarding wiring runs, intermediate feeds etc. Apart from where turnouts complicated things, the only feeds are at either end of the baseboard. One minor complication is that the electrical switch on the solitary turnout mechanism on this board should operate the polarity on a crossing on the other board. As this is part of a crossover, I decided to be pragmatic and use the switch on the opposing turnout to operate the polarity of both crossings. If the two turnouts are not set correctly, there will always be a short somewhere along the route, so it makes little difference in the end. I experimented with several methods of attaching the wires to the rails, including Masokits fishplates. Since my track will largely be buried under "ballast", weeds, dead cats and other prototypical features, I decided to go for something a little easier, yet robust. I simply flattened the copper strands of the wire and soldered them to the top of the sleeper. This is actually fairly inconspicuous anyway - but when buried will be totally invisible. I will put the boards together and do some testing over the next 2-3 months, to try and iron out any wiring or running problems. The main priority now though is to get my teeth into building some locos. Just a quick note to say that I am still very much alive and well. Work has occupied most of my time over the last month or so, as I worked to meet Christmas deadlines. Thankfully, I am nearing the end now - any new orders are very unlikely to be fulfilled by the suppliers until the New Year, so there is no longer any rush for me to do my part of the work and submit the orders. Once I have got over the shell shock, I will be back at work on the Ruston shunter and other projects. The Ruston should not take too much longer to assemble, I hope. Next in line on the loco front will be a Barclay 2-4-0 tank, based on the Lady Margaret Kit by N Brass. Barclay seems to have supplied a number of small four-coupled locos to passenger lines in the first few years of the C20, including the Whittingham Hospital Railway and the Waterford and Tramore. These had subtle differences and some were built as 0-4-2Ts. I will use the original Lady Margaret design, rather than the GWR rebuild. That way, the loco could have been supplied new to my fictitious railway. I am told that at least 2 of these kits have already been built to P4 standards, so I hope it won't be too much of a challenge for me. The big question is whether to make it compensated or use CSBs. Something to ponder over the next couple of weeks! I have done a little bit of track testing - more for enjoyment than any practical purpose. 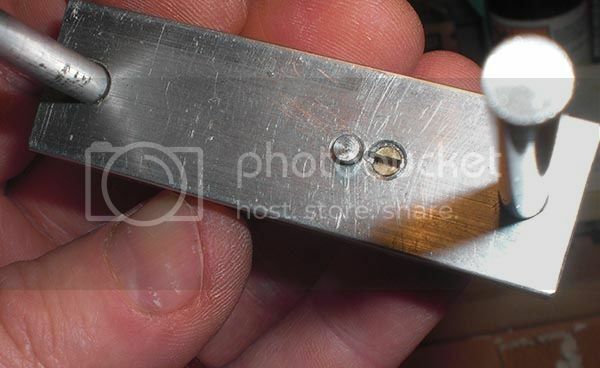 A few minor adjustments have been made with a soldering iron - mainly where rail ends were slightly out of alignment. Hopefully, there will be more frequent updates again soon! Great progress, just enjoyed reading your latest posts. It's a shame comments to you on this thread have dropped recently, but I'm not blaming anyone, I point the finger at me really as I was replying often earlier. Please don't get discouraged. I really like your idea on the rail feed soldered to the sleeper. I'm sure it'll hardly be noticeable once buried beneath ballast and dead casts (your words ), sadly though It won't work for me on plywood sleepers unless I coat one in foil....hmmm, good...no, probably a bad idea. Your baseboard looks really solid by the way, that's how I'd like to build mine in the future, 'unwarpable', is that even a word!? I've been away again for a bit so just popping of to some more threads. Thanks again, Knuckles. Apologies for not replying earlier, but I have not been on here since the start of the New Year. Instead, I had a long think about model railways in general. I really enjoyed building the track in P4 and am itching to do some more, but there is little potential with my current layout. The stuff I have learned through being a member of the Scalefour Society has really opened my mind to what track construction is all about. Howard Bolton and Tony Wilkins, in particular, have been a huge inspiration with their demos and advice. So, I have decided to put P4 on the slow burner for a short while and do a little track-intensive project in another scale. P4 won't be abandoned, by any means. I won't be logging on here very much for a while though. Thanks, everyone for your support and encouragement. Armchair Modeller wrote: So, I have decided to put P4 on the slow burner for a short while and do a little track-intensive project in another scale. P4 won't be abandoned, by any means. I won't be logging on here very much for a while though. A bit of a shame if you are giving P4 a rest for a while. Looks like that invite to Scaleforum will have to be put on hold for a bit. But its your trains set etc. Depends on what the other scale is of course. Lots of Society members have other model making interests so a little bit of something else may not be out of place occasionally. "Slowburner" means not going flat out. It does not mean abandoning things altogether! The other project is a bit of 2FS - going back to my roots, so to speak. It is unlikely ever to become an exhibitable layout though - just a couple of little experiments to satisfy my curiosity. I would not feel comfortable about accepting an invite for my P4 layout until at least the core layout and stock were thoroughly tried and tested. Virtually all the stock on my P4 layout will be either scratch built or kit built. This does take time to build and is probably never going to be as robust and reliable as most RTR conversions. Armchair Modeller wrote: "Slowburner" means not going flat out. It does not mean abandoning things altogether! Nothing wrong with that of course. Same principles, just smaller. I know of at least one person on here who has plans for a 2mm fine scale layout. Armchair Modeller wrote: Virtually all the stock on my P4 layout will be either scratch built or kit built. This does take time to build and is probably never going to be as robust and reliable as most RTR conversions. Not convinced about the robustness or relability. Depends on your materials and construction techniques and of course how well they are built. Scratch or kit built in metal and soldered together can be, and usually is. very robust. I have got a few scratch built wagons made in plastic which are now 30 years old and are fine. I was thinking about locos rather than rolling stock. The layout will need several very small tank locos to provide the first line motive power. Only time will tell how well I can build them. I did think about doing some RTR conversions first, but there is nothing really small enough. Even the Model Rail Sentinel is a bit on the large side, though I have one anyway. The Bachmann Drewry shunter is huge and would really look out of place - though I do have one of the bodies to convert, should I start to panic! Hopefully, that won't be necessary. Richard, the best little locos are from high level and Chris's service is great. I am pretty sure there are lots running so it is a good place to start if you want to jump straight into kit building. I say that as the last one I did from high level only took about 40 enjoyable hours to put together! Which is not to say that they are easy! They are beautifully engineered and the instructions are brilliant, but they are full of very small intricate parts and while there may well be lots running I just cannot get my tiny Hudswell Clark to run, basically because the driving wheels are so small that I cannot quarter them properly when they are in situ. I think I'll take it down to Scalefour north to see if Chris (whose service is indeed second to none) can give me some tips to help sort it out. David. I would say drop it in to scalefour north and see what can be done. If you don't have any luck take it along to scalefourum. I am positive it can be made to work. As you have found they are not without issues created by the builder. I have built 2 now and both had little challenges. However if you adhere to the instructions and take extreme care they do work out nicely. Can I offer to help DT can you give us a description of what it is doing and no doubt some one will have come up against the same issue and solved it... May be in another thread! DougN wrote: Can I offer to help DT can you give us a description of what it is doing and no doubt some one will have come up against the same issue and solved it... May be in another thread! Thanks, Doug. The main issue as I see it is an inability to quarter the driving wheels. They are tiny - 2'9", which is smaller than a wagon wheel, and they are too small to fit a GW wheel press (the crankpin is too close to the axle). Before fitting them in the chassis, therefore, all one can do is to quarter them by eye (not easy as the gearbox and motor is in the way) and then hope for the best. Unfortunately, however, it is then almost impossible to adjust the wheels - and certainly not with any delicacy - as the chassis is higher than the top of the drivers and one cannot therefore get any grip on the drivers. It's nearly there, but not quite. It could be, of course, that I could enlarge the crankpin holes in the coupling rods a smidgeon to see if that would help, but they don't actually seem too tight (except at the point when they jam) and I'm fearful of making them too large. I think that Ealing had a similar problem when he used these drivers, albeit in a different loco -I don't know if he ever resolved it (viewtopic.php?f=19&t=2664). This is all a great pity as the loco is otherwise virtually finished. Anyway, I fear I am in danger of hijacking Richard's thread - sorry! The Bill Bedford style of quartering jig, and other similar ones discussed elsewhere on this forum will work with any size of wheel. a search for quartering should find it. I've seen a picture of the Bill Bedford jig, but am not at all sure that it will work when there's a gearbox and motor also attached to the axle - I suspect that the two axle supports in the jig could foul them. The BB jig is good. I've trumpeted the GW wheel press on this forum to the point of tedium, however very small wheel don't allow the crank pins to fit. I asked George's advice about this at last year's Expo EM and he recommended filing the slot back into the body of the press. A bit drastic, but I tried it and it worked. David Thorpe wrote: I've seen a picture of the Bill Bedford jig, but am not at all sure that it will work when there's a gearbox and motor also attached to the axle - I suspect that the two axle supports in the jig could foul them. The widths over the axle supports are 17.6, 16.5 12.5 or 9.5mm depending on which set of slots you use. (assuming symmetry). The metal thickness is 0.3mm. So if each of your bearings has 0.3-0.4mm side play you should have no problem. Many thanks for the advice and encouragement. I have no problem at all with others giving expert opinion and advice here. However, I do think you may have missed my point. Often these days, modellers can fall back on RTR locos and DMUs or EMUs to ensure they have quickly-prepared, reliable motive power ready for their first exhibition. You can reasonably take it for granted that many of these will work reliably, before you have even started the conversion. If you have to scratchbuild or try kitbuilding for the first time, it will take a lot longer, with less guarantee of complete success. With very small locos the problem is compounded by their small size, short wheelbase and relatively few wheels for pickup. I think it would be a little reckless to promise a layout when I have neither built, nor had any experience of building any such locos. I would feel a lot happier if I got at least a core of such locos running satisfactorily before I committed to exhibit. Converting RTR stock is not really an alternative for me, as nothing really is appropriate - unless I drastically change my scenario. I don't want to convert a lot of RTR stock, only to put it quickly to one side and replace it with more appropriate kit or scratchbuilt stock almost immediately. That would be a waste of money. As to which kits to buy, I want what is appropriate for the layout. Unfortunately, the best kits are not necessarily ones I can use. I don't want to sound in any way defeatist. I just think things will take time. Armchair, I think that the best option from your post is to post a list of rolling stock that can fall into a few categories. Ie the layout had a Hunslet XYZ and a ...etc then list the items which you would have as a nice to have one day.. then a its nice and I want one (LMS Garrett? ) So that way the collective knowledge can send you in the right direction. I guess this matches the p4 RTR at scalefourum in september. Which might solve a interim problem. Hows your local area group. Someone might have a RTR conversion that they can let you borrow. This is how most of my locos have been run in as I have a few locos running and others have a layout! (Must solve that problem some time in the future! ) The whole process is a long journey as we all know. Some can produce loco's, coaches, wagons in quick succession others can Layouts. but bringing an area group into the equation results in areas being completed more quickly. I agree with you that the time it takes to produce things can be a frustration... yesterday was the first time in almost 2months that I have completed any serious modelling... and that was only 2 hours worth (Plus a trip to two supermarkets to find my favourite brass cleaner.. I managed to find a generic for the usual one I like. Esteele powder for sauce pans... will continue my search though) The pigeon van received a undercoat... still 35degrees at 6.00pm last night meant that the cleaning and scrubbing had dried very quickly... along with a very fine coat due to the primer spray can being very warm from the garage!... Need to get the air brush out tonight if every thing is OK for Thursday's afternoon meeting! The D17 will not be ready unfortunately. Any how back to topic.. give us the list of the motive power that takes your fancy! Thanks for your enthusiasm, Doug. I really don't have a problem with working things out and doing everything myself. I just don't want to rush into doing any exhibitions. The project is primarily a means to exploring what I can do in P4 - and that will take as long as it takes! As for stock, all will be revealed in due course - probably as I work my way through, project by project. Please be patient! It is nice to hear that you believe I have enthusiasm . My little issue at the moment is I am willing but time is in short supply.. though it is a little warm to sit with a soldering iron at the moment... weather is hovering in the mid 30's for the rest of the week here in melbourne it seems that the new year has attacked the modelling time currently.. no doubt it will return... I tend to write on the forum during lunch at work.... they would think it a bit unusual to pull out some modelling at this time! Encouraging others to get in and have a go is what it is all about.